Do you ever find yourself sitting around thinking “I wonder how @YakovMironov feels about that”? Well now is your chance to find out. 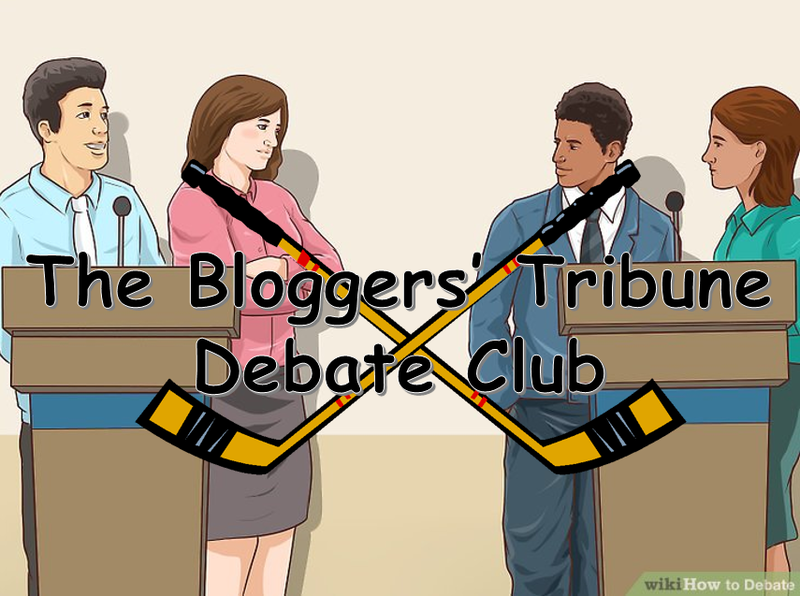 Welcome to the first meeting of the Bloggers’ Tribune Debate Club. We’ve assembled a group of bright minds (and Tom) to discuss this week’s news that the NHL has decided to forgo the Olympics next year. This is not a round table – stop it…it’s not. What are your thoughts on the NHL not going to the Olympics? Jon (@YakovMironov): Two competing views exist in my head on this one. When I think about the Olympics that I really enjoyed watching, the 1994 Olympics with the Forsberg shootout win was probably the most exciting one and that was pre-NHL participation (except for Nedved). I’d be perfectly happy to watch hockey federations pull from second tier leagues and junior to build a team. Having some NHLers go overseas for a season so they can participate and/or have teams grant permission to players to leave will be fun as well. Also, the Sochi tournament was some of the worst hockey I’ve watched in my life and blowing up the tournament after that works for me. On the other hand, this is a lot more salt that the NHL and PA didn’t need to deal with. There was going to be a lockout no matter what because both sides are idiots, but this seems like actively destroying an olive branch to the players especially when you consider the NHL is likely to take a hit on attendance and will definitely take a hit on TV viewership during the course of the Olympics. This season the NHL averaged 6.5 games a night over the dates that the Olympics will fall on next season. I’d be shocked if they average more than 3 games a night during that time frame as NBC will own the sports marketplace with their garbage primetime recap show. Conclusion, they probably should have let them go, but I’m happy to watch the world burn. Cat (@catmsilverman): I’m of two trains of thought here. On one hand, I love high drama. I watched Westworld, for God’s sakes. I love when things spin out of control – and while I admire a lot of the business-related decisions that Gary Bettman has made over the years, I’m absolutely on the edge of my seat waiting to see if he’s finally become too tone-deaf for even hockey’s oldest of the old boy’s club. On the other hand, though, I’m upset for the players. Representing your country is the highest honor in the world; the fact that the NHL effectively stripped that from the players purely for profit is heartbreaking. It’s going to affect the players who are able to go, too; an Olympic gold is still an Olympic gold, but who feels good about winning against what amounts to a team of scabs? The Russian, Swedish, and Finnish teams are going to be icing predominantly top-tier pros, as the players who wanted to stay skating in their home nations will be there. The Canadian and American teams, though, will be stripped bare – and the German team is going to be absolutely devastated by it. The German NHLers are the biggest stars on their national team. It’s sad. Tom (@PuckDontLie): Honestly, I’m not nearly as heartbroken as most seem to be. It’s cool to see the best players in the world at the Olympics, but the fact of the matter it that all fun was coached out of the games in Sochi. Canada was so good at picking up Mike Babcock’s system that neither they, nor the opposition were able to make the games exciting. I will watch the games regardless, because that’s what I do – watch sports. It’s not an overly big deal to me that the NHLers won’t be there. Avry (@Avry): Safe to say I’m a bit bummed. Here was a chance once again for the best players in the world to play in THE premier global sporting showcase and it’s not going to happen. I’m not surprised though, South Korea was an Olympics that wasn’t a slam dunk to see players at but for a league that talks about wanting to grow the game in Asia, this doesn’t help things at all. Mike (@mikecommito): For once it would be nice if the NHL just got out of its own way. Unfortunately, this is just another example of the NHL’s shortsightedness. It represents another episode, in a long list of many, of how out of touch it is. For all the talk of the league wanting to enhance its global presence and grow the game, this can’t be classified as anything but a missed opportunity and a step backwards. Turning down the invitation to showcase your sport’s most elite talents and reach new audiences isn’t just myopic, it’s foolish. What do you expect the tournament to look like in their absence? Jon: The Under 23 tournament idea that is similar to the Olympic soccer tournament seems to be the most appealing. It plays on the popularity of the World Juniors, captures more of the “amateur” spirit that the Olympics pretends to have, and opens it up to NCAA and potentially AHL prospects (if the NHL will allow for that small concession). I think a lot of people would get excited for that. Too bad that won’t happen in a million years. With the NHL closing a door, the next biggest market and talent source is the KHL and they will be more than happy to their players showcased in potentially a market they can see themselves expanding into and at the very least play games that will be in prime time for Russia. Other European leagues will also have no issue with participating, and with players like Datsyuk, Kovalchuk, and possibly Ovechkin as star power at least on one squad, you can kiss the U23 idea goodbye until at least 2022. Cat: Have you seen the World Championships? Ok. That, minus the slew of Canadians that always show up when Edmonton misses the playoffs. So… the World Championships, minus any the good North American teams. I think the game will be much smaller, a bit slower, and not nearly as riveting. It’s going to be good hockey, but it’s not going to draw quite the crowd it would have – and I think it’s going to be disappointing. I say that with all the respect in the world for Mark Arcobello and Mason Raymond, of course. Tom: The Spengler Cup. The tournament is almost certainly going to be made up mostly of guys playing professionally in Europe. A who’s who of former fringe NHLers, AHL star and failed first round picks – Dustin Jeffrey, Nigel Dawes, Gilbert Brule to name a few. No, it won’t look like the World Juniors – stop with that idea right now. The Olympics take place in the last month of the junior seasons and the CHL isn’t going to want their best players absent for the playoff push. Not to mention, the NHL would likely put pressure on the CHL not to send players – and thanks to the financial aspect of the NHL/CHL agreement, they’d likely have to listen. Avry: Beer leaguers. Fully expecting Hockey Canada to send Jim’s Auto Body All-Stars out of Sudbury to represent Canada. Kidding. I’m expecting Canada to send a team similar to what you see at the Spengler Cup, full of European pros, AHL players and maybe a few NCAA ones and guys on contract holdouts. For the Americans, you’ll see the same but teams like Russia? If NHLers do go anyway, ouch, it may be a rough tournament for the North American sides. Mike: Early speculation suggests that the tournament may resemble that of the 1994 Lillehammer Games; the last time the NHL didn’t send players to the Olympics. But before we get too nostalgic thinking about Peter Forsberg’s iconic goal, we may have to adjust our expectations. Although there are rumblings that the rosters will be filled with players from the minor professional leagues in North America and Europe, and even the junior ranks, it’s hard to envision a scenario where the NHL doesn’t put pressure on its affiliates and partner organizations to align with its decision. If that happens, we’re more likely to see a Spangler Cup-type product on the ice, which isn’t necessarily a bad thing, but there’s no question it will be a significantly lower caliber of hockey. Of course, if the Olympics is looking to differentiate itself from the oldest hockey tournament in the world, there is no shortage of players in recreational and senior league from which to draw. I, for one, would like to welcome Sean Burke to Sudbury’s Cambrian Arena next Thursday evening. There, he will find a coterie of the Nickel City’s finest skaters, including a versatile two-way forward who backchecks with the same dedication he applies to his hockey history writing. What is the long-term fallout from this? Jon: The IOC and IIHF wanted to look tough, but they’ll be right back at it trying to get the NHL into the 2022 games, they’ll just have a more organized plan B if they have a repeat of 2018. The NHL’s decision not to go might actually help them in the next lockout, which was probably going to happen if they went to the Olympics or not. Instead of Olympics being a given, it’s something they can give up in negotiation to not have to deal with things like escrow and hockey related revenue. They might not even have to hear the idea of eliminating the salary cap, which should be gone. Instead, it will be a lost season, a CBA depressingly similar to the one we have now, and Olympic participation in 2022. Yeah! Also, any future World Cup will still be terrible and it shouldn’t be watched. I think 2022, the IOC and the NHL will be in a bit of a Cold War, so it’s entirely possible the NHL misses another Olympic Games. Long-term, it diminishes the on-ice product being offered at the largest world stage – which, when it really comes down to it, means the game isn’t going to grow nearly as much. Tom: Lockout? Nope, that was going to happen anyway thanks to the absurd level of escrow the players are currently paying.Long lasting angst internationally? Naw, despite what the IOC says, the NHL will end up going to the 2022 games in Beijing in an attempt to grow the game in the world’s biggest market. More than likely, the biggest take-away from all this is likely to be the NHL fixing the World Cup. NHL executives have mentioned in the past that they would like to turn the WCoH into a bigger event. What better excuse than this? We already know the gimmick teams are gone – now just expand the field to a dozen teams and play some preliminary round games in Europe. Fixed. Avry: Long term this sets the stage for the World Cup of Hockey to become the premier international hockey tournament for NHLers. It’s something that Gary Bettman and company have total control of and we’ll be able to watch the dynasty of Team North America when the fans demand they return by storming the NHL offices and refusing to leave until they are a tournament fixture from now until 2088. Eventually, I think one day this could set up for men’s Olympic hockey to mimic the soccer format in the men’s tournament where it’s a U 23 event of its own with a cap of 3 overage players and quite honestly that would be pretty fun to watch, NHLers or not. Mike: Moving forward, it’s clear that this decision will have a significant impact on the league’s relationship with its players and the IOC. Immediately after the announcement was made, a number of prominent players expressed their disappointment and have candidly voiced their displeasure with the NHL’s position. Most notably, Alex Ovechkin has already thrown down the gauntlet, indicating that he will still go to Pyeongchang, come hell or high water. More interesting than what this means on an individual level for players, however, is what this could mean leading up to the expiration of the collective bargaining agreement in a few years. NHLPA executive director Donald Fehr has already intimated that the association may look to exact some revenge during the next round of negotiations. It remains to be seen whether this episode poisons the well, but for now, it’s clear that there are storm clouds on the horizon. Meanwhile, the IOC has also lamented the NHL’s decision, but it’s unclear what it means for the league’s participation in the 2022 Beijing Games. It’s probable that the National Hockey League would be welcomed back into the Olympic family with open arms, and it’s unlikely that Gary Bettman would turn the opportunity to grow the game in China. However, the Commissioner also recently said that, “if the IOC would move the Olympic hockey tournament to the summer, that would be great.” Ice hockey actually debuted at the Summer Games in Antwerp in 1920, but it’s worth noting that this was before there a Winter equivalent. But besides this novel historical linkage, is this a viable option? The owners, always keen to avoid a costly midseason disruption, might welcome that type of shift. Nevertheless, if the NHL is truly adamant about participating in Beijing, it’s unlikely that we will see hockey in the Summer Games anytime soon. If a change were to occur, odds are it wouldn’t happen until after 2022.